Happy Holidays to SOEL and IDLL! Holiday Gift Guide: Build a Children's Book Library in Every Room! Share with parents the importance of books in the home! Scholastic Reading Club editors created a “top book picks” list for every room in the home and every age group from ages 0-17. Share this holiday gift list to help find the right book for every child. Happy Holidays! *For secondary teachers of all subjects. Click title for flyer. * Open ONLY to Washtenaw and Livingston County. Click title for registration. 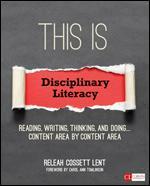 SAVE the DATE: March 23- Reading, Writing, Speaking and Thinking Within the Disciplines with Releah Lent. Registration to come! 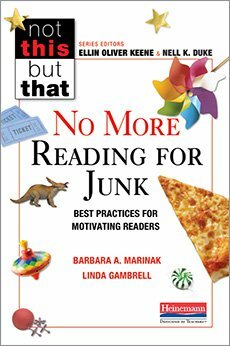 In No More Reading for Junk: Best Practices for Motivating Readers, Marinak and Gambrell point out the research against extrinsic rewards for reading, such as tokens or food. Reading rewards should be related to reading! Showing examples of a book you didn't like- and explain why. Celebrating all reading- not just completion of books. To learn more, read No More Reading for Junk. The National Council of Teachers of English (NCTE) Council Chronicle published this piece last month. It showcases K-12 teachers around the country who have worked to include diverse literature in their classrooms and what a difference this is making in teaching and learning. Also included is a resource list for teachers seeking to use more diverse texts. See the article HERE. Check out CommonLit for texts for upper level students. Users can search by Lexile, grade level, genre, and theme. There are also paired texts and each passage includes text-dependent questions. Another wonderful free resource for text comes from MeL.org. Administered by the Library of Michigan in partnership with Michigan's libraries of all types, the Michigan eLibrary (http://mel.org) will provide all Michigan residents with free access to online full-text articles, full-text books, digital images, and other valuable research information at any time via the Internet; and provide an easy-to-use interlibrary loan system to allow Michigan residents to borrow books and other library materials for free from participating Michigan libraries. Middle and High School Teachers! The Inquiry into Disciplinary Literacy and Learning is a professional learning network for secondary teachers of all subject areas. What reading, writing, speaking and listening looks like in the disciplines. What we can do to best prepare students to meet the disciplinary demands of college and career reading and writing, with attention to standards. *This session, for grades 6-12 teachers of all content areas, will evaluate how blended learning can be used to personalize learning for students. *This is most useful for grades 4-12 teachers of all subject areas. It is centered on writing in the content areas. join us for learning about the Essential Instructional Practices in Early Literacy! There is considerable interest across the United States in increasing the number of children who are reading at grade level by the end of third grade (e.g., Rose, 2012). Some responses to this interest, such as mandatory retention policies, are not supported by the weight of research evidence (e.g., Reschly & Christenson, 2013). In contrast, research offers substantial support for the impact of professional development, coaching, and specific instructional practices on literacy growth (e.g., Carlisle & Berebitsky, 2011; Purcell-Gates, Duke, & Stouffer, in press; Yoon, Duncan, Lee, Scarloss, & Shapley, 2007). In Michigan, an Early Literacy Task Force has been formed to support professional development, coaching, and the use of research-supported instructional practices statewide. The Essentials rely heavily on research and focus on high-utility instructional practices. Participants will get an awareness of the Essentials and determine the strengths and challenges of literacy instruction in their own schools in relation to these. will understand SAT writing in order to support students. STAY TUNED for Winter Professional Learning offerings! ReadWriteThink, a collaboration of the International Literacy Association (ILA), and the National Council of Teachers of English (NCTE), is a trusted source for teacher created and teacher approved literacy based activities for the K-12 classroom. ReadWriteThink has a plethora of resources for back-to-school, including community building, booklists, autobiographies, literacy centers, and team building activities. Check it out! This is relevant for K-12 teachers. 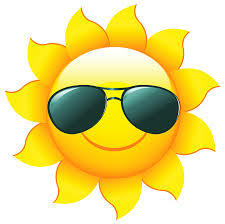 If you haven't checked out the Michigan eLibrary lately, do so before your students leave for the summer! The Books and Literacy Gateway is full of FREE PreK-12 reading materials for students to access. You may also want to listen to this archived webinar from MeL on Summer Reading 2016. Going into it's fourth year, the Study of Early Literacy of WISD and LESA (SOEL) will continue working on PreK-3 literacy instruction, and now has the Essential Instructional Practices in Early Literacy to grow our work around best practices. I've been fortunate to continue collaboration with literacy educators from around Michigan on the Early Literacy Task Force of the MAISA GELN. 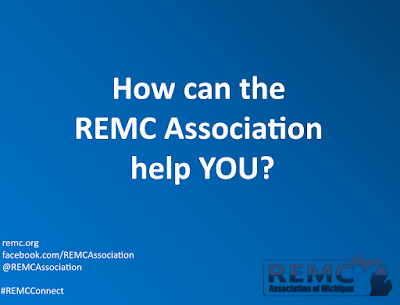 Members of the Task Force include Dr. Nell Duke of UM and Dr. Tanya Wright of MSU, along with representatives from a number of educational organizations in Michigan, including not only ISDs, but also MRA, MDE, MACUL, MEMPSA, and REMC, among others. In developing the documents, we relied heavily on research and focused on high-utility instructional practices. Additional documents, such as Essential Practices in Literacy Coaching and Literacy Essentials School-Level Companion Document are also in the works. Task Force leaders Joanne Hopper (MAISA GELN Director), Naomi Norman (Interim Assistant Superintendent, Achievement & Student Services at the Washtenaw Intermediate School District and the Livingston Education Agency), and Susan Townsend (Director of Instruction & Learning Services at the Jackson Intermediate School District) continue to pull the group together for collaboration on this work. ***If you are interested in professional learning around the Essential Instructional Practices in Early Literacy, please join us for the SOEL Summer Institute in August! ***Please see Nell Duke's article on the Essential Practices in Early Literacy recently published in Literacy Daily of the International Literacy Association, from which this passage was adapted. Adobe Connect License Pricing and the $AVE Bid Project.